This craft activity is great for a windy, spring day. It’s would be a great Pentecost Sunday School craft. 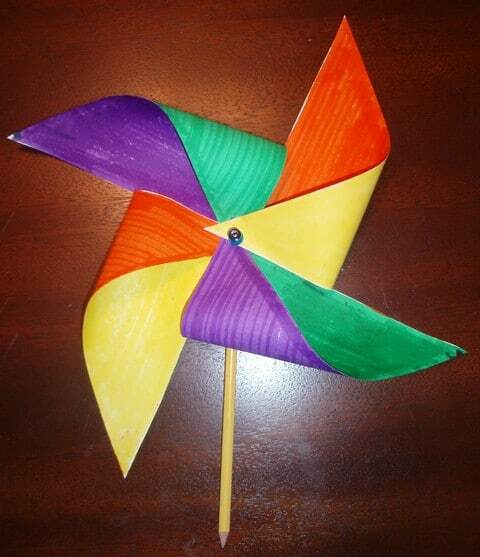 The children will make a pinwheel to teach them about how God is a spirit. A lesson can be taught, followed by making the craft and the children will finish by playing with their pinwheels outside. Click here to leave your comments or suggestions about this craft idea. Fold the construction paper on the diagonal from corner to corner. Open the paper up and fold on the second diagonal across the other two corners. When the paper is opened flat, the folds make an “X” across the square. Make one cut along each fold beginning at the corner and cutting toward the center. The cut should stop about halfway toward the center. The cut should not go all the way to the center of the square. 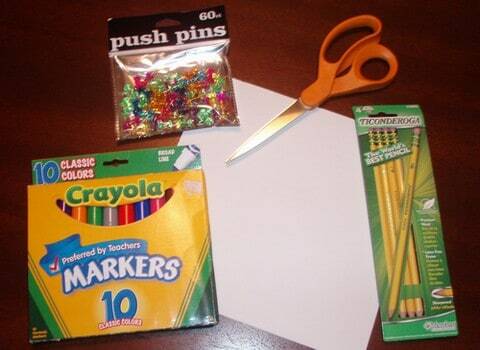 Decorate each section of the square on both sides of the heavy construction paper using the materials provided. Take every other corner, one at a time and gently pull it up to the center of the square. When all four corners meet at the center, take the thumb tack and push it through all four corners through the center of the square. Push the thumb tack through the eraser of the pencil. Blow on the pinwheel and watch it spin! Use this craft to teach the children about how we can hear and feel the wind, but we cannot see it. We can see the results of the wind, but we cannot see the wind itself. Relate this to God. We can hear His voice through His Word and feel His peace, comfort, joy, etc. We cannot see Him, but we can see the results of His work. If you are using this for your Pentecost Craft in Sunday School, be sure to see our other resources to help you explain Pentecost for children. I recommend using a square which is 6 inches or smaller in diameter. You want the length from one corner to the center of the square to be shorter than the pencil. 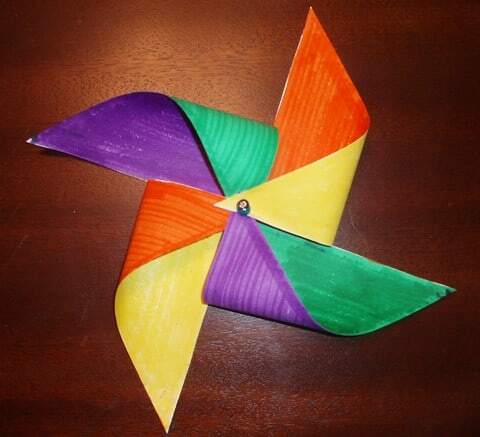 The thicker the paper you choose to use, the more sturdy the pinwheel will be. Thick paper will better withstand to the wind and blowing by a child. Do not push the thumb tack all the way through the pencil eraser causing the pinwheel to attach tightly to the pencil. If pushed in too tightly the pinwheel will not turn. Here is another website we found with helpful illustrations of folding the pinwheel. Let me just say thank you, thank you thank you for this website! I am a Sunday School teacher at young (12 years in existence) church in Baltimore, MD. A couple of years ago a church restructured Sunday School so that all of the Sunday School classes (adults, teens, and children) would be learning about the same topics/themes each week during Sunday School. Well, the curriculum of lesson overviews are not child friendly by any stretch of the imagination. At one time, prior to the restructuring, we were purchasing children’s Sunday School curriculum’s. That began to prove itself a costly expense that wasn’t always getting used up as the attendance would fluctuate in extremes at times. As the children’s Sunday School teacher I have to adapt all of the lessons now. I am a teacher by trade. So, I know what a child friendly lesson looks like. This website has been a Godsend, literally. I came across the website about a year ago and I frequently come here for lesson ideas. Thank you so much for providing this as a resource for universal Kingdom advancement. Please let me know where I can send a monetary donation. This website is a blessing and I want to sow a seed (perhaps several seeds over time) and bless you back. Tony Kummer (Editor) reviewed & updated this page on : May 16, 2016 at 9:35 pm. All our content is peer reviewed by our readers, simply leave a comment on any post suggest an update.